Almora district is a district in the Kumaon division of Uttarakhand state, India. The headquarters is at Almora. It is 1,638 meters above sea level. The town of Almora is surrounded by Pithoragarh district to the east, Garhwal region to the west, Bageshwar districtto the north and Nainital district to the south. The hill station of Almora is situated on a horseshoe-shaped ridge of a mountain, the eastern portion of which is called Talifat and the western one is known as Selifat. The landscape of Almora attracts tourists each year for its views of the Himalayas, cultural heritage, handicrafts and cuisine, and is a business hub for the Kumaon region. Developed by the kings of Chand dynasty, it was later maintained and further developed by the British regime. The ancient town of Almora, before its establishment, was under the possession of Katyuri kingBaichaldeo. He donated the major part of this land to a Gujrati Brahmin Sri Chand Tiwari. Later on when Chand kingdom was founded in Baramandal, the town of Almora was founded at this centrally located place in 1568 by Kalyan Chand. In the days of the Chand Kings it was called Rajapur. The name ‘Rajpur’ is also mentioned on a number of ancient copper plates. Almora town was the administrative headquarter of the Kumaun district; that was formed in 1815 following the defeat of Gorkha army in the Anglo-Gorkha war and the 1816 Treaty of Sugauli. The Kumaun district then consisted of the complete Kumaon Division excluding the Terai district with its headquarters at Kashipur. In 1837, Garhwal was made a separate district with its Headquarters at Pauri. 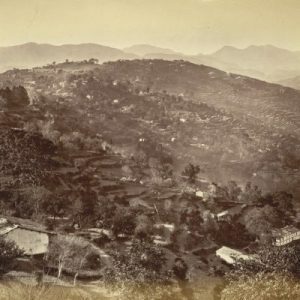 The Nainital district was carved out of the Kumaun District in 1891, and the Kumaon District was then renamed Almora District after its Headquarter. In the 1960s Bageshwar district, Pithoragarh district and Champawat district had not yet been formed and were part of Almora district. Pithoragarh district was carved out of Almora on 24 February 1960 and Bageshwar district on 15 September 1997.